The leading culture and entertainment group Rastar (300043.SZ) reveals its new gaming brand “Rastar Games” during the brand conference hosted in Shenzhen Marriott Hotel Nanshan on the 25th of May. After their Football club RCD Espanyol achieved their best results in 12 years earlier this month -8th ranking in the La Liga, Rastar Group uncovered its next important move. 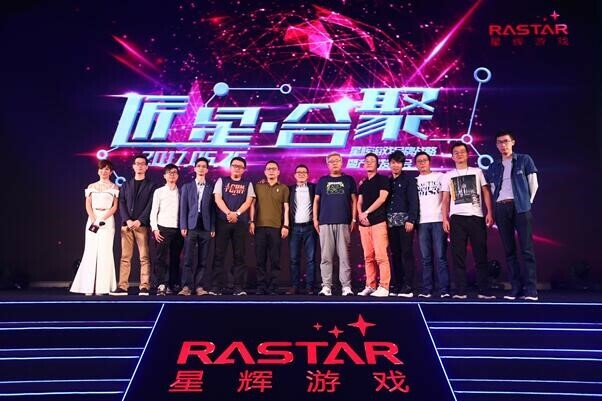 Paul Zheng, general manager of Rastar Group and the CEO of "Rastar Games", announced that the brand has been officially released. He also sketched the development strategy of the new project. In August 2013, Rastar Group began to explore the global game market. During the past 4 years, Rastar Group has originated a game business group structured by three core companies: Teamtop Games, Chang Yu Tian Xia and Xing Qu Games, as well as dozens of upstream and downstream developers, distributors and gaming platforms firms participated through capital. In March 2017, Rastar Group organized the gaming group - "Rastar Games". With the concept of "Let the Fun Surround You", Rastar Games is at an advantage by publishing resources and their experience in developing strong entertainment in various fields and to provide players with an all-around delightful experience. Paul Zheng stated that "Rastar Games" would insist on evolving two genes during future developments. The first gene is the global-oriented integration of game developer and publisher. It consists of brand development, shared experience and the integrated management of the "propose-develop-publish-operate" model. The second gene involves advertising traffic management. Specifically, it integrates the high-quality internal advertising resources and expands the advantages of precise global advertising and big data analysis. Moreover, Rastar Games will focus on improving three main aspects, including the ability to develop advantageous SLG and MMO areas, the usage of sustained and precise advertising and the adaptability of popular products. The signing ceremony for two significant IP products - "The Black Troop" and "An Oriental Odyssey" was also held during the conference. Candy Zhao, the vice president of Rastar Games, successively signed to have joint developments of super IPs with "HUACE FILM & TV" CEO Changlin Qu and the CEO of Guangzhou Chaoshen, Huai Liu. Through the strong combination of films, anime, and games, Rastar Games will continue to explore a multi-channel business model, combining pan-entertainment and IP-development throughout the industry. Rastar Games is the new gaming brand founded in 2017 by Rastar Group (300043.SZ), which consists of Teamtop Games, Chang Yu Tian Xia, Xing Qu Games and many other holdings. Some of the best titles include Yitian, Dragon Knight, Fire Rush and Romance of Heroes. With the concept of "Let the Fun Surround You", Rastar Games will leverage its advantage in the entertainment industry and provide a rich and superb entertainment experiences.